Is there such a thing as the best coffee brewing method? How do you determine what’s the best one? What are the criteria when comparing different brewing techniques? Sure the technical details such as body, color, caffeine content, etc… are important for coffee aficionados. For you as a coffee lover, however, the most important criteria is your personal taste. You like your coffee with an unhealthy amount of sugar? It’s fine. You like it drenched in milk? That’s fine too. Your taste is the most important. If you feel that there is room for improvement in your coffee routine? There always is. If your morning coffee routine has become rather tedious, and if once in a while you get the sensation that your coffee brewing methods are close to limited, don’t despair. There is still hope. We come to rescue with this list of the best coffee brewing methods. One or more of these brewing methods will surely enhance your morning coffee experience. Yes, we get it, you know how to brew coffee. Everybody knows how to load their drip coffee machine with some grounds and press the button to start it. Drip coffee has a lot of advantages and many of us prefer it. Let’s mention here convenience and personal preference. And if you own a Technivorm, or the Behmor Brazen, yes, you get a nice cup. But not all drip coffee machines are equal. Anyway, forget about your routine for a little, and enter the wonderful realm of brewing great coffee. We will talk about the various and most popular methods used for brewing coffee. Our main intent is to show you that price of equipment is not the most important thing when aiming for perfect coffee. The price, however, will be reflected in convenience of the coffee maker. When the pits of the coffee cherries are harvested they are in a relatively stable state. That’s what we call green beans. After harvesting, the beans go through the roasting process, and this is what we buy from stores, or from our favorite roaster. The roasted beans get ground and from the ground beans we extract soluble compounds, aromatic oils, and caffeine. The process of extracting these compounds in a water solution is what we call coffee brewing. Coffee enthusiasts love this watery extract, and various objective and subjective factors affect the taste and aroma of the final cup. The brewing method can be tweaked to control caffeine amount and specific flavor and aroma. This extraction can be made by cold brew which is cold extraction or by hot extraction. Some brewing methods involve pressure during the extraction. Espresso and AeroPress are two of these brewing techniques. Cold extraction will result in a milder cup, very appreciated by people with sensitive stomach. Hot brewing will allow more of the bitter compounds to be passed into the cup of coffee. Too much heat and the coffee will be over-extracted, and will taste very bitter. On the other hand, caffeine, the active compound in coffee, will be best extracted at higher temperatures. Pressure allows more of the oils to be extracted. Because coffee oils are volatile, there is a small temperature window where they are best extracted. A low temperature will not allow the dissolution, and a too high temperature, too long brewing time, and the oils will evaporate. Pressure facilitates the process of washing these oils into the cup. This why espresso is so fragrant, compared to other brewing methods. 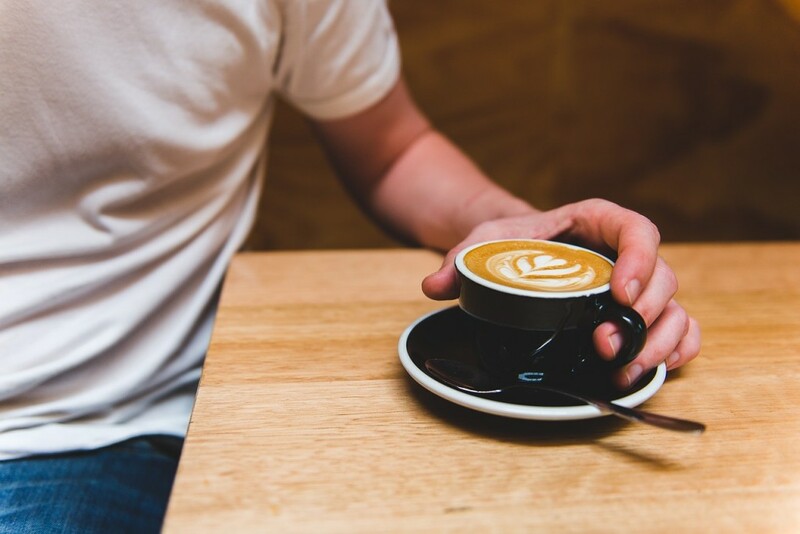 Due to its worldwide popularity and mildly addictive property, coffee is one of the most common guilty pleasures and stands in the top 5 gourmet discussion themes. Not only that, but when under decent dosage, coffee also has medicinal properties. The amount of extracted caffeine is controllable as long as you know how to brew coffee. The ultimate best way to brew coffee is a sensitive matter, and it’s personal. We can’t say that a specific brewing method is definitely good or definitely bad. Elements such as the quantity of volatile oils that end up in the final cup, the aroma, the taste and the coffee cloudiness are subjective variables. This is what makes choosing the best way to brew coffee impossible. Coffee is served in so many different ways around the world, from clear drip coffee to cloudy coffee or to espresso. The secret is in the brewing method and, moving forward, we will discuss the different brewing methods and some of the best ways to make coffee. Espresso machines manufacturers have transformed espresso drinking from a coffee shop exclusive activity to a pleasure we can enjoy at home. More and more people are agreeing that espresso is one of the best coffee brewing methods. Espresso was for many years a synonym for gourmet coffee. And still is, even though manual brewing techniques have reemerged from oblivion. Espresso as a way to brew coffee is a precise process that consists of hot water pushed through a puck of compacted ground coffee. The espresso grind size ranges in the fine spectrum. The fine grind size increases the amount of extracted soluble solids. This is partly the reason for the full bodied coffee. The process of compacting coffee grinds is called tamping and it serves to increase the pressure during brewing. The tamping is probably the most precise operation during pulling a shot of espresso, and it is a constant among all other variables. Espresso involves pushing hot water with 9 bar of pressure; this is is the other constant of the method. The pressure, however, can vary with some manufacturers. Everything else can be adjusted within relatively strict margins. These adjustments account for personal taste, coffee beans and equipment. Espresso is my personal favorite brewing method. 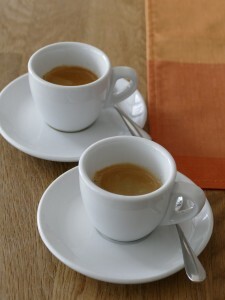 Take a look at our espresso tutorial, it’s a great piece. We have a couple of espresso machine reviews, but we liked this article about super automatic espresso machines. The brewing quantity for an espresso is small, 2 or 1 oz. Espresso brewing results in a less clear coffee in comparison to drip coffee and less caffeine extract per grinds quantity. All in all, espresso is a concentrated and powerfully flavored brew meant to satisfy the cravings of any strong coffee lover. Manual coffee brewing has gotten a lot of attention lately, and the French press, the French drip have started to regain the once lost popularity. But along with them, pour-over and AeroPress have gained fans all over the world. The simple brewing techniques have their advantages, and they are cheap. 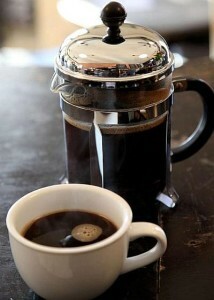 The French press, due to its convenience and affordability, is still one of the most popular brewing methods. French press is a brewing appliance employed for steeping coffee grinds in a beaker. By using a plunger-filter we get our grinds pressed down at the bottom of the beaker where they remain trapped, resulting in a clean cup. For a French press the recommended grind size is coarse, but coffee enthusiasts experiment with finer grinds for a cup with more body. By using a coarse grind size none of the grinds will escape into your coffee, and there will be no silt in your cup. Because of the coarse grind though, the coffee needs a few minutes of steeping for a complete extraction. A normal French press cup is very much similar to drip coffee. It has about the same strength, and taste, but with a little more body. Due to the prolonged extraction time, French press has a bit more kick, and this is one of the reasons many people appreciate it. The preparation requires a little more grinds for the same quantity of coffee. French press coffee has an amazing aroma, a strong flavor and when it comes to strength, it can be easily adjusted during the steeping by adding more grinds per brewed cup. Learn how to make a great coffee with a French press here. The popular belief that drip coffee brewing is cheap is absolutely wrong. Like any other product, price and quality are in direct relation. If you use the cheapest drip coffee machine the result will be bad coffee. SCAA standards require strict water temperatures for brewing, and a specific brewing time at that temperature. Most drip coffee machines do not respect this standard. So is it really worth the price you are paying for your Bonavita? Yes, it is. The more expensive machines are expensive because they need to recover the investment in research, and because they use expensive materials to ensure the standards are met. Let’s go back now to our main subject. A lot of people prefer drip coffee due to the fact that it’s very convenient to make. Another reason is because it requires a minimum level of knowledge or practice. Also, drip coffee can extract more caffeine per scoop used, than most of the other brewing methods. This is a great incentive for people who need a constant kick during the day. The brewing, as we mentioned it, cannot be any simpler, my 6 years old son could do it. 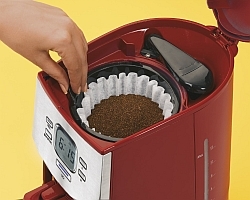 Just place some ground coffee into a paper filter and press a button. The coffee machine will do everything else auto-magically for you. It will heat the water and then pour it over the grounds at a certain flow rate. The grounds saturate with water, and solid soluble and caffeine will be washed into the dripping liquid. I said paper filters earlier, but there are also metallic, mesh filters. The most commonly used are paper filters, but if you want your coffee more bodied, and with a bit more oils, the permanent metallic filters are for you. It is a matter of personal preference. Many coffee aficionados think highly of drip coffee because its distinctive clean and smooth taste. Obviously, the coffee maker can make or break your daily joe, but if you own one of those great coffee machines, you will get a the most flavorful cup, without the grit, the silt, and all these in a clean cup. In contrast to Turkish coffee, espresso or French press, drip is a clean, clear cup. The amount of soluble solids extracted is average. Drip contains more caffeine per scoop of grounds used than most other brewing methods. This is because of the high brewing temperature that facilitates caffeine extraction. Properly brewed drip coffee, has a great aroma, but cannot match espresso or French press. As I said, automatic drip coffee machines are very efficient, being able to brew for a few people in minutes, however, they are not very flexible in terms of tweaking the brewing parameters. Coffee enthusiasts have rediscovered the manual brewing. Manual drip brewing, widely known as pour-over coffee, is very flexible in terms of tweaking the brew. A barista can modify the brewing temperature, the steeping time, the filter, etc… By changing these we can aim for perfection when we brew drip coffee. For an in depth article, take a look at our article about drip coffee. Also known as Arabic coffee or Greek coffee, the Turkish coffee brewing method, is a big hit among coffee aficionados. Turkish coffee is very inexpensive; the “equipment” costs only a fraction of what other brewing methods cost. The flavor and the taste make it the choice of coffee lover who like a strong cup of joe. The fact that this brewing method is so incredibly old also brings a bit of respect. It’s not only the tradition and the inexpensive nature of it. This brewing method delivers the most rich and strong cup. No other brewing method can deliver that. If we were to compare brewing methods, drip coffee would the cleanest cup, and at the opposite side of the spectrum would be Turkish coffee. The brewing is pretty simple, but it needs precision. Just go one second over the needed brewing time, and your caffeinated drink is flat. The method implies steeping finely ground coffee in hot water. Colder burners are recommended, for a proper control of the proper temperature. One of the key factors in brewing a great Greek, or Turkish coffee is the grind size, which is the finest possible. The finely ground coffee, almost to a powder, absorbs water very fast, and saturates easier than the coarser grinds. The finer the grind, the easier will sink at the bottom of the cup after brewing. The special grind size also facilitates the extraction. Turkish coffee has more soluble solids, and coffee oils than any other method. 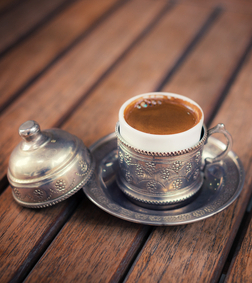 Turkish coffee is the best way to obtain a perfect balance between flavor and caffeine content. while with this brewing method we can extract a serious amount of caffeine, the flavor will weaken in direct correlation with the amount of caffeine extracted and so, through adjusting the amount of extracted caffeine, we control the intensity of the flavor. Drinking Turkish coffee is a great way of experimenting the taste of different sorts of coffee beans, as this type of coffee is very strong and reflects hugely on the coffee bean’s characteristics. People that already love Turkish coffee have absolutely no problem with the coffee’s dense aspect, strong taste, cloudiness, or with the fact that the grinds are actually in the cup. If you haven’t tried Turkish coffee yet, you might want to give it a try because you will be in for a very nice surprise. There are many people who love coffee but simply can’t drink it. For people with sensitive stomachs, cold brew is the best alternative. 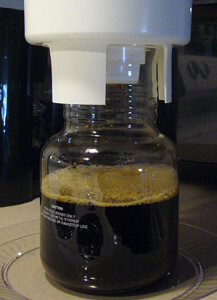 Cold brewing is not as convenient as classical ways of brewing coffee. It takes at least 12 hours to brew it, and this is the reason why is not as widespread as hot brewing. The advantage is that cold brew can be kept in the fridge without any effect on the coffee. As a result, people who consume cold brew make serious amounts of coffee and store it in the fridge. Cold brew lovers swear by its distinctive smooth taste and delicate flavor. Even people who can stomach hot brewed coffee find the delicate flavor of cold brew very tasty. With cold brew, the process can take as long as a day. The process involves steeping ground coffee in cold water. Because cold water will extract the goodness in coffee at a very slow rate, compared to hot water, we need to let the grounds soak for at least 12 hours. The longer we steep, the stronger the coffee will be, and more caffeine is extracted. Equipment can be as cheap as 0 $ investment. If you own a French press for instance, you can use that for the steeping. Cold brew lovers, however, own more sophisticated equipment. The advantage of such equipment is the convenience. You can brew more coffee at once and then store it in the fridge. The reputable Toddy Cold Brew System has been a long time the only option on the market. This changed, however, and we have now a lot of other choices. Cold brewing happens at low temperatures, room temperatures, or fridge temperatures. Due to these low temperatures the profile is different from and other coffee you tasted. Many of the coffee oils will not be extracted. None of the bitter compounds extracted at higher temperatures will not be present in cold brew. This will result in an incredibly smooth coffee, which many people find delicious. People who like a kick to their coffee will probably find cold brew boring, and without personality. The coffee is very strong, because the recipe requires a lot of grounds per brewed cup. But the coffee is always diluted with water, milk, ice, in a ½ to ⅓ ratio, depending on your taste and recipe. stronger than with the other methods of brewing. Although the amount of extracted caffeine is smaller, most cold brew lovers have no problems with it, because they can just have another cup. Learn from our article how to make cold brew at home. You can also check our post comparing cold brew coffee makers. My name is Dorian, and I am a former barista and an eternal coffee lover. I write about coffee and promote good brewing practices. I aim to help my readers understand how can improve their daily coffee routine, and to find their true coffee taste. It's not about trends, it's about your taste.